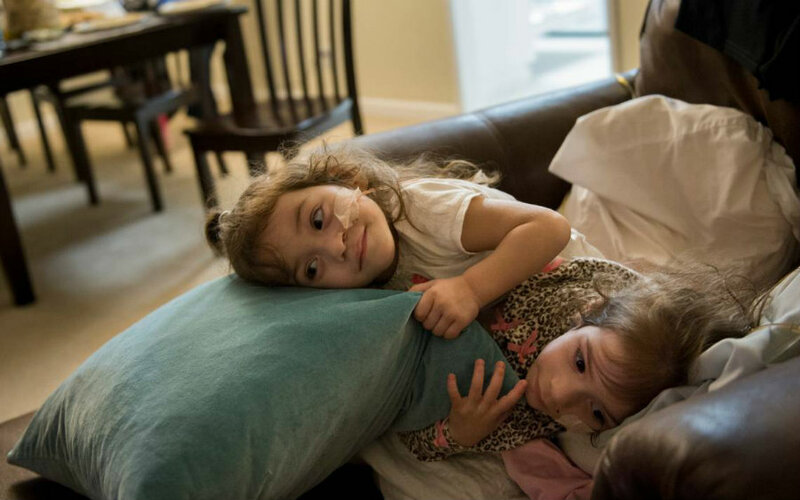 Eva and Erika Sandoval are finally two separate toddlers after a 17-hour surgery at the Lucile Packard Children’s Hospital Stanford Tuesday. The girls were born conjoined from the chest to the pelvis, sharing a bladder, liver, parts of their digestive system and a third leg. Each girl has now one leg and will remain in the hospital for the next two weeks for observation. Arturo and Aida Sandoval expressed their relief and excitement after the surgery outcome. Over 40 family members were at the hospital to show their support. The couple first saw their twins in separate beds at the Lucile Packard Children’s Hospital Stanford pediatric intensive care unit Wednesday. Lead surgeon Dr. Gary Hartman directed a team of 50 physicians, nurses, and operating room staff during the marathon procedure. The surgery started around 08:00 a.m. Tuesday. Eva spent 17 hours in separation and reconstruction while her sister Erika spent 18 hours, according to hospital officials. After the surgery, each toddler kept a part of the organs they were sharing, and each kept a kidney. The third leg was used for skin grafts to cover the extended surgical wounds that made it possible for them to be independent bodies. Doctors had already suggested that one of both girls would need a prosthetic leg and after knowing the results of the procedure, both children will. The girls are recovering under sedation in the same room but in different beds and will remain in the hospital for up to two weeks to follow up their recovery. Their father, Arturo Sandoval, said the surgery was “a major success.” He said he is curious to see how his daughters will react when they wake up. He also shared his amazement, saying his twins went from one to two in less than 24 hours. One of every 200 thousand births result in conjoined twins, and about half of them are born stillborn. If the conjoined twins are born alive, 35 percent of them survive only one day according to the University of Maryland Medical Center. Not all surgeries that try to separate conjoined twins are successful. Stanford doctors estimated a 30 percent chance that one or both twins would not make it through the lengthy procedure. But Eva and Erika have proven to be stronger than the odds and now lie in separate beds recovering from the 17-hour surgery. The Sandoval twin sisters were born in August 2014, months later their mom, Aida, found out she was pregnant, a surprise since she was 44 in 2013. She has been married to Arturo for 25 years, and both have three grown children of 18, 23 and 25 years old. It was a shock to discover Aida was pregnant with twins, but the bigger surprise was revealed later in the pregnancy. After dozens of appointments and different doctors, the Sandovals were told they had 40 to 60 chances to have conjoined twins. The couple was warned that if the pregnancy was carried to term, Aida life’s could be at risk. The couple was offered several times the option to terminate the pregnancy. Arturo feared for his wife’s life, but Aida was determined to bring the girls to this world. Right after being born, the girls had to stay their first seven months at the hospital before going home with their parents. Eva and Erika paid the hospital several visits because sharing a bladder caused them frequent urinary tract infections. Eva grew physically larger than her sister Erika, dragging the smaller girl around as they played. That was the moment when doctors recommended the separation: They worried the disproportion would become dangerous to the children. The twins survived those long hours in the operating room and other previous challenges, but they still have to face some others. Dr. James Goodrich explains the first 72 hours are typically the most critical since complications frequently manifest during that period. Until now, both girls are doing fine at the hospital ICU. Goodrich is the director of pediatric neurosurgery at Children’s Hospital at Montefiore in New York. He has successfully separated twins in the past and recently separated two American boys at the New York hospital in October. Twin brothers Jason and Anias McDonald were recording saying “dada” after their successful surgery to separate the now former conjoined twins. The two boys underwent the procedure in October and were joined by the head. In the video, both babies are squirming and trying to talk to each other. Both managed to say “dada” while they were moving and smiling to each other, something only possible after the 16-hour surgery that Dr. Goodrich led to separate the twins. Their mother, Nicole McDonald, posted on Facebook the video and also wrote that last November her babies entered the operating room for what would hopefully be the last surgery the twins will have. The boys needed to receive skin grafts.